A heart-warming image of two male lions resting their heads together has won the top prize in the Wildlife Photographer of the Year awards. Band of Brothers, taken by London-based photographer David Lloyd, shows the moment the lions greeted one another by rubbing their faces together for around 30 seconds. The lions are likely to be brothers; the Natural History Museum said capturing such a moment between family members is rare. Some 16,000 nature fans voted to pick the winner, helping judges to whittle down a shortlist of more than 45,000 photos. Judges also selected four images as "highly commended". Matthew Maran’s timely shot of a fox walking towards graffiti art in north London captured the attention of judges. An heartbreaking image captured by Justin Hofman shows a starving polar bear searching for food in the Canadian Arctic. Polar bears are facing the reality of global warming as their habitat shrinks. Earlier this week, an emergency was declared after around 50 of the animals were filmed hunting for food in rubbish discarded by a residents of a Russian town. 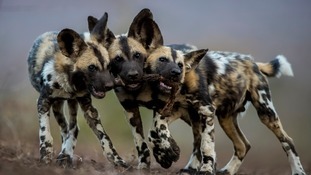 Hungarian photographer Bence Máté has also been commended by judges for his image of three painted wolves playing with the leg of an impala. Wim Van Den Heever's shot of three king penguins on a beach in the Falkland Islands also made it into the top five photos submitted. The animals appear almost as though they are engaging in conversation as the low sun shimmers on the horizon.